Can you tell the difference between English and French mould ripened cheeses? What do you know about the ageing of cheese, and the way it changes as it ages? What should you include in the perfect cheeseboard and should it change with the seasons? And what is the difference between a pasteurised and unpasteurised cheese? You can discover the answers to these and a whole host of questions you may not have even thought of at our Cheese Master Classes. These informal but highly informative sessions are led by Teddington Cheese's Managing Director Tony Chuck. They are held on the third Thursday of each month at our Richmond shop. Places are limited to ten people to ensure plenty of opportunity to ask questions. The sessions start at 7.30p.m and last for approximately two hours. We offer selected wines to accompany the cheese tastings, including a red, white and a sweet dessert wine, so that you can learn the best pairings. 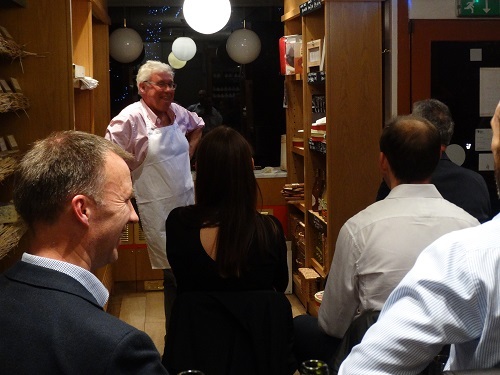 The price of a Cheese Master Class is £40 per person, which includes all of the cheeses and the selected wines. A place at a Cheese Masterclass makes an unusual gift and vouchers are valid for 12 months. Alternatively, if you have a specific date in mind, you can call us on 0208 977 6868 and book your place directly.